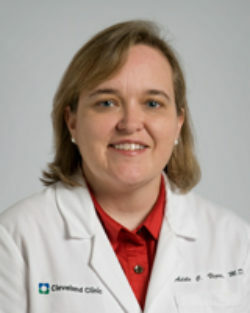 Adele C. Viguera, MD, MPH, is director of research for women’s mental health of the Cleveland Clinic Neurological Institute. In addition to her research efforts, this mother of three continues to dedicate her time to teaching and mentoring psychiatric residents, fellows, medical students, and junior faculty. She enjoys listening to classical music and spending time with her family. Years of research, teaching and clinical activities have led Dr. Viguera to recognize that women have unique needs. She began to focus on women’s mental health. Dr. Viguera has centered her specialty to women with psychiatric disorders throughout their reproductive life-cycle. Her major research area is mood disorders, in particular bipolar disorder. In women, it is particularly prevalent during the child-bearing years. Prior to her career at Cleveland Clinic, Dr. Viguera was an assistant professor of psychiatry at Harvard Medical School and has also served as the associate director of the Peri-natal and Reproductive Psychiatry Clinical Research Program at Massachusetts General Hospital. Dr. Viguera grew up in Buffalo, New York, received her undergraduate degree from Harvard University, her medical degree from Dartmouth Medical School, and her Master's degree in epidemiology from the Harvard School of Public Health. She completed her internship in medicine from Massachusetts General Hospital, residency training in psychiatry at McLean Hospital, and a fellowship in peri-natal and reproductive psychiatry at Massachusetts General Hospital. She has published many articles in the area of women’s mental health during pregnancy, and the post-partum period. Dr. Viguera is a recognized speaker at numerous conferences both nationally and internationally. She has been a guest speaker at Speaking of Women’s Health conferences addressing the subject of women and their moods. To request an appointment with Dr. Viguera, please call 216-444-CARE or visit the Online Appointment Request form.